The good news is that it actually can be! Now, don't go and dump it on the curb in front of your house thinking the weekly trash pick up will take care of it. The fact is that most municipal waste management firms will not take care of it. "Many charities refuse to sell donated mattresses, but they will accept mattresses to reuse, or they will recycle them for you. Call non-profit thrift stores and charities in your area to ask about their policies on accepting used mattress donations. Some charities, like GoodWill, do not accept any mattress donations, while others only accept mattresses in select locations. Keep in mind that charities accepting mattress donations are generally short on space. Twin-sized mattresses are more helpful and needed than queen- or king-sized mattresses." An alternative to donating to a charity or other organization is to simply donate it to a friend, family member, or someone you know in your community who is need of a spare or replacement mattress. "...in most parts of the country, used mattresses can be resold as long as they meet certain labeling and processing requirements." What this means for private individuals is that it can be quite costly and labor intensive. So, it may not be worth the investment. In addition, you would only want to sell it locally since shipping a mattress would be cost-prohibitive. Mattress Disposal: Dumping or Recycling? So, if you can't easily donate it and selling it is too much cost and work, that only leaves a few other options. And, probably, the most common impulse is to simply haul the thing off to the local landfill dump and get rid of your mattress there. While this is a legitimate option, it can also be labor-intensive and a bit costly. Most regional landfills charge a fee for each mattress (and box springs) plus you need to have a vehicle that can safely accommodate a mattress and, possibly, a set of box springs. But do you really want to contribute to a growing waste management problem by adding your old mattress to a rapidly diminishing number of landfills? It's been estimated that close to 20 million mattresses end up in landfills annually, and one mattress alone can take up to 40 cubic feet in a landfill. Although dumping them in this way is still legal in most states and is an allowable option, recycling can be a better choice. Did you know that up to 90 percent of your mattress can be broken down and those materials recycled? This includes materials like the wood frame, steel springs, polyurethane foam and any outer foam. You can dismantle the mattress yourself, if you are inclined to, and bring all the recyclable materials to your local recycling center. And you can even get some cash for parts like the springs in the form of scrap metal. 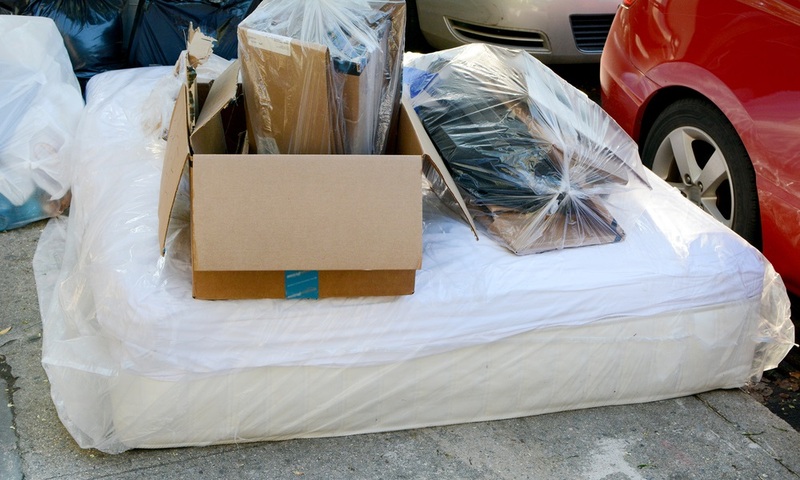 California has a law that allows residents to recycle their mattress for free, or for a small fee, through Extended Producer Responsibility (EPR) programs. The bottom line is that you should never dump mattresses on the side of the road, however. Either drop them off at a landfill, or dispose of them through a local mattress recycling program. Old mattress disposal does not have to be a major headache. By bringing in a professional team of junk removal experts, you simply have to point to the items and sit back while they do all the work. At Junk King, our full-service mattress removal and recycling eliminates the need for maneuvering old mattresses because we can haul and recycle the items for you. You can recycle your old mattress today and even schedule bulk junk pickups by calling or by booking online. Our professional and insured mattress disposal team will show up at your home or office; we call 15 minutes before we arrive on site and we’ll give you a free estimate based on how much room your items take up in our truck. You point and we haul your items into our junk removal trucks, with no hidden fees. Ready to get rid of your old mattress? It’s as simple as 1, 2, 3. You make an appointment by booking online above or by calling 1.888.888.JUNK (5865).